Bali, Indonesia owns so many waterfalls that you probably aren’t able to see them all. This 2-day waterfall route will lead you to the best waterfalls in Bali. This route can be done from Ubud to Lovina or the other way round. Before you leave, get enough drinking water, put your swimming outfit on, bring some good hike shoes and download offline maps! Also, check out our 3-week Bali Route. Grab a motorbike or arrange a drive from Ubud who takes you to the Nungnung Waterfall. The drive from the center of Ubud takes about 40 – 50 minutes. It’s a 509-step stairs hike to the waterfall but it’s a 100% worth it. The entrance fee is 3000 IDR. Hop back onto the motorbike and drive about 50 minutes to the Banyumala Twin Waterfall. You’re now in the area called Munduk, and there’s a lot to do around Munduk. The hike down to the waterfall takes about 15 minutes but is doable. On the foot of the waterfall, take a little swim to cool down and enjoy its beauty. The last waterfall of day 1 of this Bali waterfall route is the Munduk Waterfall. Just a 15-minute drive from the Banyumala Twin Waterfall. After this last waterfall in Bali, head over to you stay for the night. Find a pleasant place to stay online in the Munduk area. Make sure to have a very good breakfast and resupply your water stock. Get back on your bike and head over to the Sekumpul Waterfall. From Sekumpul to the GitGit waterfall is a 35-minute drive. Git Git is next to the road and is a very popular waterfall. That’s why you should be here before noon. The entrance fee is IDR 5000, which isn’t too bad! 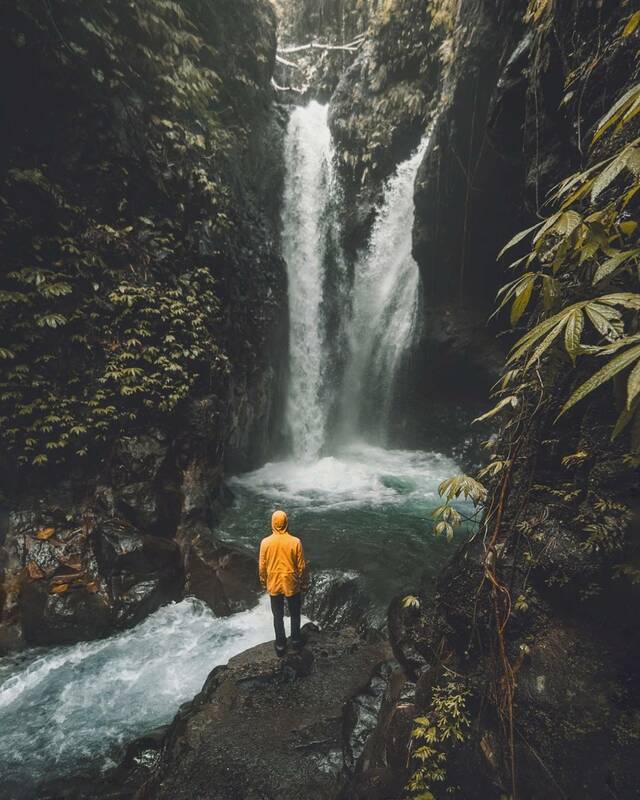 The Sekumpul Waterfall is an hour drive from the city center of Munduk and probably the hardest fall in this Bali Waterfall Route to get to. It’s not entirely unknown, but it’s a little dislocated which keeps the crowds away. The hike down is 40 minutes at least and along the most incredible rice field views and this waterfall is Bali’s best! The entrance fee for Sekumpul is IDR 5000. Hoping you still have the energy for the last waterfall. Aling Aling is located near Lovina and Singaraja. There is a natural waterslide which you can slide down. Which should be your end destination for this 2-day route. 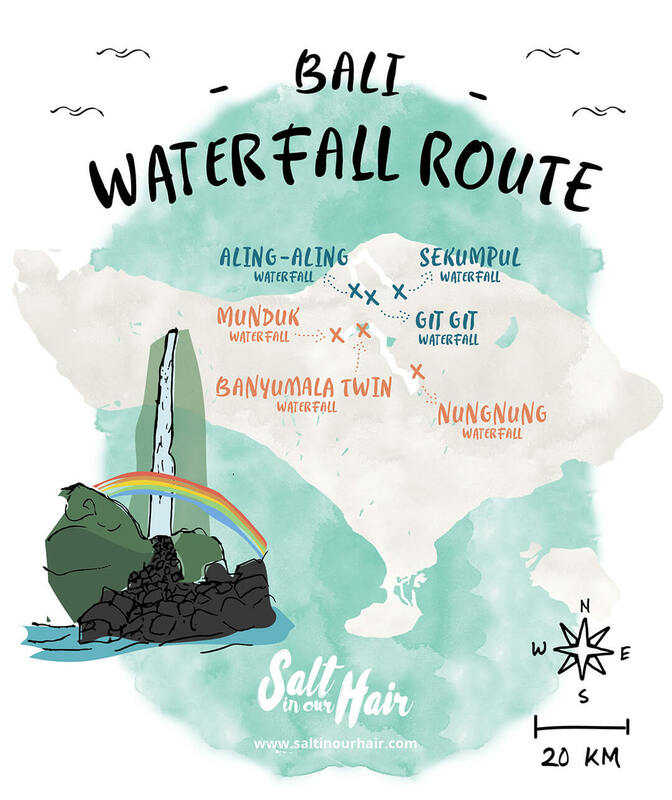 And as we said before: You can also do this Bali Waterfall Route the other way round. From this point, drive to Lovina or Singaraja and relax on the beach! Our driver was amazing! Contact him and tell him you want to do the same waterfall route as Nick & Hannah from Salt in our Hair. He will know where to take you! https://www.facebook.com/balifriendtours/ The total amount was for two days was 1.300.000 IDR (~$94) and split the costs between 5 people. Well worth it!